Following on from optimising the storage for a customer, I decided to change the queue depths for the Emulex HBAs. The ESX hosts, each have two dual-port Emulex HBAs, the diagram below shows the setup..
Only two ports are in use at the moment, vmhba2 and vmhba5. To determine the instance numbers that are in use by the Emulex ESX driver – lpfc (use qla2300 or similar for QLogic), the output of the ls command includes a number for each active HBA in the system. We can then use the instance numbers to find the active adapters. Running the command on vmhba5 is also as expected. Now that we’ve found out which vmhbas are active, we can use the output to find out which lpfc# options we should add to the lpfc_740.o module to configure the queue length. The -q option shows configured options for a module. Now we reboot for the changes to take effect. In this case, both HBAs lpfc0 (vmhba2) and lpfc3 (vmhba5) will have their queue depths set to 64. With this post and the previous one, we have set manual load balancing for the LUNs over eight different paths and also changed the queue depth to 64, this should keep the ESX optimised for now, maybe I’ll change the VMFS3.MaxHeapSizeMB to 64 for good measure! So I deal with a lot of customers on my travels, and most have multiple ESX servers and occasionally I receive the odd request for a change here and there. As you all know, with VI3 and the latest releases of ESX3.5/VC2.5, almost all configuration and most advanced configuration can be achieved by using the VI Client connected to VirtualCenter. But how long would it take to add another portgroup to a vSwitch with a VLAN ID for 20 ESX servers? Quite long, if you have the time or the patience then thats fine, but I’d rather script something like that. By using the VMware RCLI (Remote Client) you can send vicfg- (esxcfg) commands to both ESX 3.5 and ESXi hosts. Originally it was intended for use with ESXi due to it having limited service console but the functionality is also provided for ESX 3.5 hosts. The VMware Infrastructure Remote CLI provides a command-line interface for datacenter management from a remote server. This interface is fully supported on VMware ESXi 3.5 and experimental for VMware ESX 3.5. Storage VMotion is a feature that lets you migrate a virtual machine from one datastore to another. It is used by executing the svmotion command from the Remote CLI. The svmotion command, unlike other RCLI commands, is fully supported for VMware ESX 3.5. I use the RCLI with SSH access enabled, so now my RCLI acts as a service console proxy server. To send an esxcfg- command to an ESX 3.5 host, I would now log into the RCLI using SSH and then send the commands from the RCLI’s command line, or execute a .sh script on the RCLI. So let’s use our example above…. 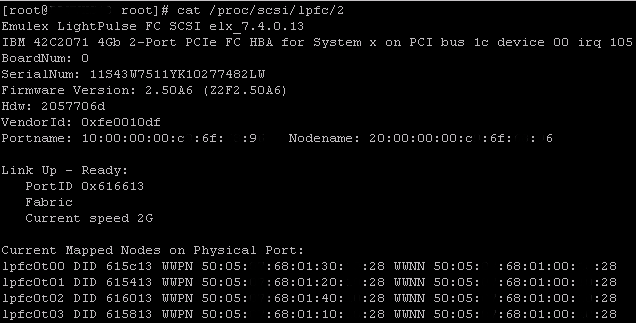 to add another portgroup to vSwitch1, with a VLAN ID of 123 onto 20 ESX 3.5 hosts. Now you can either repeat the above for all 20 servers or script it into a shell script..
Now save, make the script executable and then launch it, and the script will create the new portgroups on all the servers in a couple of seconds. Recently a customer had a few issues with having all VMs using the same path to the LUNs, this was down to putting too many workloads onto servers that were used as a proof of concept. Inadvertently, SAN problems arose so I was asked to checkover the storage. As you can see the path policy is currently set to mru, most recently used path policy is best used in an active/passive configuration. So how do we now go about changing the policies on all our servers? Well we could use VI-Client and change each datastore to use a different path – doing this for 10 datastores per server with 20+ servers? howabout no! The alternative then would be to script it. The script from Yellow Bricks is of particular use, as for each LUN it finds it uses a different path for each LUN. The script just sets each LUN up to use a preferred path, but obviously for default installations of ESX, you cannot use preferred path when you are using mru policy. So we must change all LUNs to use fixed path policy first. So now we have the servers using different paths for each datastore. It only took a couple of seconds to change the policies on each server using these scripts, obviously using these as part of a build script would be ideal for deployments where you know the SAN configuration. VCDX is not a follow on from VCP and is not currently a VAC or Partner program requirement, this should be seen as an advanced Certification and is only applicable to architects who have designed and deployed enterprise environments. The Enterprise Exam is available this month. Candidates can check their skills and assess their suitability for this exam online via our Certification page : http://mylearn1.vmware.com/portals/certification/ Only those who meet these qualifications will be able to attend the exams. The Design exam is now in Beta development. We expect design submissions and presentations will begin in Q308. Here’s a summary of what I know about the VCDX over the last few days…. 4. Successfully pass a grilling by your peers, most likely chaps from VMware PSO on a design and implementation plan. It’s upto you to decide if you really need to go on the course to pass, so a read of the blueprint will probably give you a guide as to the level that you are at. The official preparation for the Design Exam, also non compulsory are two new, unreleased courses from VMware, the first is aptly named Design Patterns (release Q3/Q4) and the second course is an unknown at the moment. IBM came back with a workaround to my problem,….All workarounds have been tested and work. 1. Use ESXi instead (No service console, hence no PSOD. Also no mouse services in the console needed, hence no PSOD (this is the problem that I was experiencing). then reboot the host, obviously you will get a PSOD but reset it and all should be well thereafter.